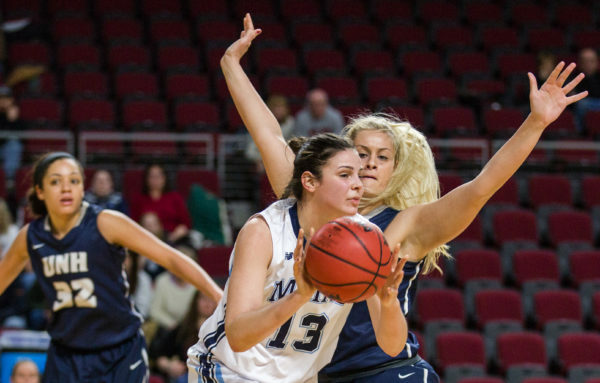 University of Maine's Laia Sole (center) goes to pass past University of New Hampshire's Morgan Bassett-Smith during their game at the Cross Insurance Center in Bangor in February 2017. UMaine Black Bear Naira Caceres (right) sprints past Purdue Boilermaker Ae'Rianna Harris during their women's basketball game at the Cross Insurance Center in Bangor in November 2016. University of Maine's Anita Kelava battles for a rebound during a basketball game at the Cross Insurance Center in Bangor in January 2017. University of Maine's Tihana Stojsavljevic (right) goes to take a shot before being fouled as University of Massachusetts Lowell defender Oda Shackelford reaches out during their basketball game at the Cross Insurance Center in Bangor in February 2017. 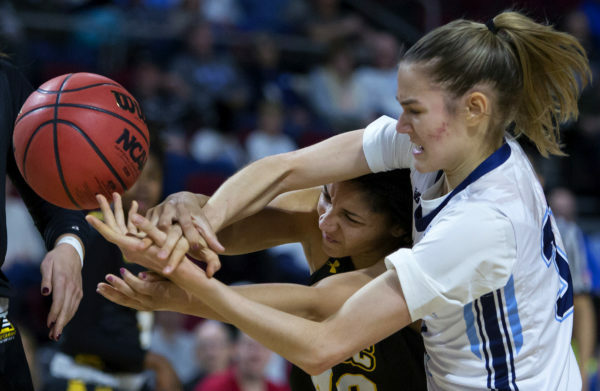 The youthful University of Maine women’s basketball team appeared to be well positioned to remain one of the top teams in America East during the next three seasons. Now, the Black Bears have several holes to fill moving forward. 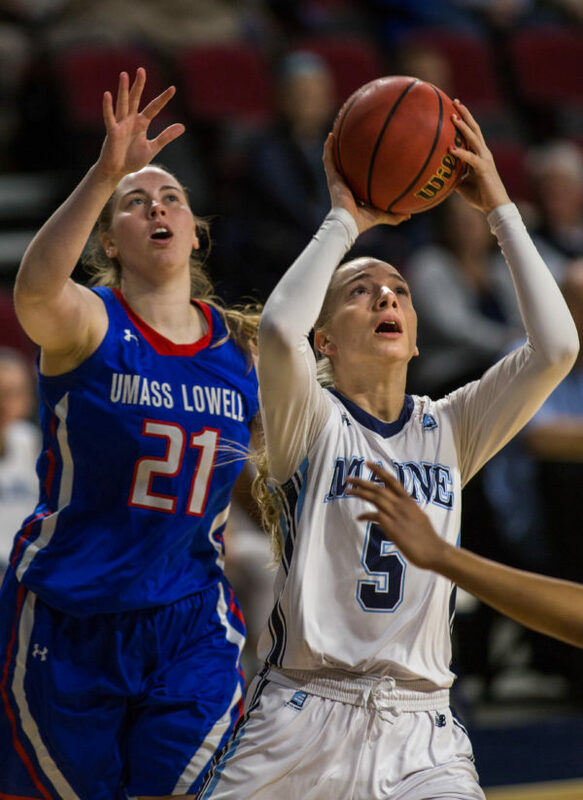 Bret McCormick was the first to report Thursday morning on Twitter that standout post player Laia Sole and emerging forward Anita Kelava, both freshmen, are among five players who have been granted their release by UMaine and are free to transfer. Sophomore guard Isabel Hernandez Pepe, freshman guard Naira Caceres and freshman forward Tihana Stojsavljevic also are leaving the program. “We would like to thank these five student-athletes for their contributions to our program over their time at the University of Maine and wish them well in their future endeavors,” associate head coach Amy Vachon said in a press release. UMaine athletics said it would have no further comment about the transfers. Vachon is expected to use some of the departed players’ scholarships to help fill out her roster, which presently includes seven returnees and one National Letter of Intent signee, shooting guard Kelly Fogarty of Walpole, Massachusetts. Sole, a 6-foot-2 forward from Igualada, Spain, was one of only three Black Bears to receive America East all-conference recognition as the Sixth Player of the Year and a member of the All-Rookie Team. She started 15 of 34 games and was second on the team scoring 9.4 points per game. Sole, contacted via Twitter, said UMaine was not the right fit for her. Sole, who was fourth on the team with 24.6 minutes per game, also posted 3.6 rebounds per contest but was only a 56-percent shooter from the foul line and committed a team-high 87 turnovers (2.6 per game). The lanky Kelava, a 6-3 forward from Zagreb, Croatia, started coming into her own later in the season and wound up starting 18 of 34 games. She averaged 3.4 points and 2.3 rebounds and blocked a team-high 32 shots. Kelava averaged 15.5 minutes but played 25.3 per game in the America East tournament. Caceres, a 6-foot guard from Las Palmas De Gran Canaria, Spain, averaged 19.4 minutes while starting only eight of 34 games. She posted 3.1 points and 3.7 rebounds, but saw her playing time reduced later in the season and logged a total of seven minutes in the postseason. Caceres shot 31 percent from the field, the worst among players in the regular rotation, including 19 percent from the 3-point arc. She was fourth on the squad with 55 turnovers. Stojsavljevic, a 6-2 forward from Zagreb, Croatia, appeared in 19 games for UMaine and averaged 1.5 points in 4.9 minutes per outing. She played only seven minutes over UMaine’s last five games. Hernandez Pepe, a 5-10 guard from Rome, Italy, had a limited role in her two seasons. She played in 30 games, averaging 1.3 points. UMaine (18-16) finished fourth in the conference standings and advanced all the way to the championship game before falling to the University at Albany for the second straight year. The Black Bears — whose roster had only two seniors and included seven freshmen, including six international students — were inconsistent this season. UMaine also had to deal with the loss of their head coach as Richard Barron was forced in January to take medical leave because of issues with a condition that sometimes affected his ability to stand or walk. He recently revealed that he is being treated at the Mayo Clinic in Rochester, Minnesota. Former Black Bears star Vachon guided the team in Barron’s absence. The loss of the five players, Sole and Kelava in particular, will leave two more holes in a rotation that loses senior all-conference standout Sigi Koizar and backup forward Sheraton Jones to graduation. 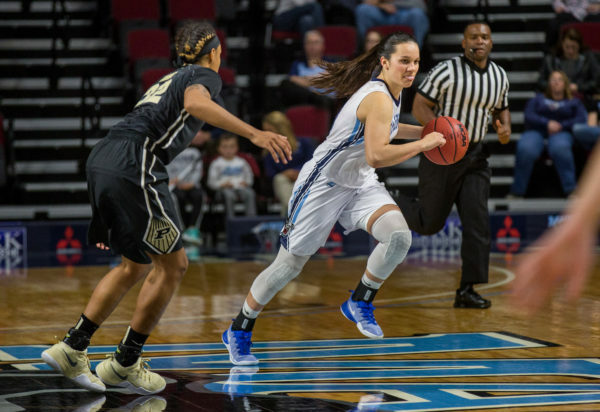 UMaine will return four of its top six players in minutes played with freshmen Blanca Millan (27.2) of Spain, Canadian Julie Brosseau (19.6) and Fanny Wadling (19.6) of Sweden along with sophomore transfer Tanesha Sutton (26.4). Millan (8.6 points per game), Sutton (7.4), Brosseau (6.8) and Wadling (5.0) were the team’s Nos. 3-6 scorers behind Koizar and Sole.